The 2017 CCEH Annual Training Institute (ATI) marks the 15th premier capacity-building event for organizations to prevent and end homelessness. Attendees learned about key strategies in housing solutions, youth and family services, coordinated entry and exit, and methods for including mainstream providers (such education systems, hospitals, and criminal justice systems) into regional homeless service provider networks. As we work towards our 2020 goals of ending family and youth homelessness and look to maintain the successes already achieved in ending veteran and chronic homelessness, the Connecticut Coalition to End Homelessness offers guidance on national best practices and opportunities for collaboration across the state. (Y) Next Steps to Ending Youth Homelessness: The work to end youth homelessness by 2020 is underway and new approaches are needed in engaging, assessing, and serving unstably housed young people. This track will focus on creative solutions to providing safe and stable housing for this population. (F) All on Board to End Family Homelessness: This track will focus on successful strategies for helping prevent first episodes of homelessness through diversion and mediation, as well as building systems of support around children and parents experiencing homelessness. (A) Cutting Edge Approaches to Ending Homelessness: New strategies in rapid re-housing, client engagement and utilizing data will be featured in this track. (S) Building on Our Successes: Learning from the tremendous successes of the past couple of years, this track will feature unique efforts by local providers to embrace the changes to our crisis response system, including work of shelters, housing providers, and coordinated entry staff. (E) Putting It All Together: Building Systems for Everyone: Utilizing knowledge gained from building our crisis response system, this track will focus on creating housing solutions for populations at risk as they re-enter communities from incarceration, hospitals, and the child welfare system. (Q) Access and Assistance for All: Serving LGBTQ people – This track highlights best practices in serving our LGBTQ community and assuring safe shelter, fair housing, and welcoming environment for all in our service provisions. This is an informative session to learn about what A Way Home America is doing nationally in their efforts to help end youth homelessness through strategies such as the 100 Day Challenges. The workshop will also highlight a local Connecticut effort, the Youth Action Hub, who will be presenting the results of their study on how to improve access to housing and other services for young people in CT.
Kelly King Horne, Executive Director of Homeward, the planning and coordinating organization for homeless services in the greater Richmond, Virginia region, will share some innovative strategies being implemented in her state to end family homelessness and the paradigm shift she has seen in her region because of their success. In a difficult housing climate, some agencies have taken creative approaches to housing their clients. This workshop will present three strategies that have been shown to effectively link difficult to house clients with stable housing. Connecticut providers have built a Coordinated Access system that has revolutionized our work and is serving our clients better than ever before. With numerous funding uncertainties before us, how will we maintain and improve it? This panel will explore the implications of shifts in state and federal funding for Connecticut’s homelessness response system, and implications for fundraising going forward. Attendees will gain insight from a range of different types of funders into how we can think about developing the resources that to match the needs of our system. This workshop will explore the integration of care with health care and criminal justice, and ways to collaborate and maximize opportunities to serve households who are likely touching both mainstream and homelessness service systems. The transition to housing from the experience of homelessness is not necessarily easy. There is a lot to learn – or re-learn. Before budgeting and cleaning and figuring out meals and how to deal with loneliness, there’s the need to learn about the lease and what it really means. This workshop will help you understand leases in plain language, so you can help teach people you work with what it is all about. It’s important to teach what to do, and what not to do, as part of building a strategy to enter housing, become a good tenant, and retain housing for the long term. Chris Robinson, Chrysalis Center Inc. Many youth become homeless or housing unstable because of conflicts with family members. Mediation has been proven to be an effective strategy to resolve conflicts to keep youth and young adults stably housed. Come see what mediation actually looks like and learn one new trick for moving people away from their positions into a more flexible space for negotiation. Brenda Cavanaugh, Community Mediation, Inc. 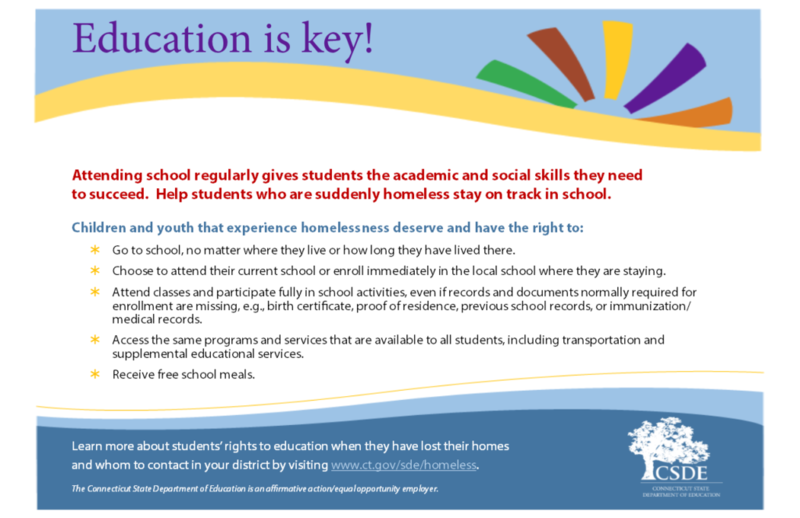 This workshop will focus on how communities and providers can work with their schools to implement strategies to improve the engagement and identification of unstably housed and homeless youth. Highlighted will be the work of the Meriden school district in raising awarene ss through the use of the School Engagement Packet. Learn all about the PIT and what it means for your community. This session will include the keys to successful planning, execution, and reporting on Point-in-Time Counts. Five agencies embarked on an intensive learning collaborative to shift their shelter models to be housing-focused and low barrier. Members of the Learning Collaborative will be joined by the Learning Collaborative facilitator to share their stories and reflect on some of their greatest challenges and successes. Homelessness disproportionately effects members of the LGBTQ community, yet to this day many individuals face discrimination when seeking assistance. In this workshop participants will learn effective language and definition of terms associated with the LGBTQ community, strategies for being an ally to the LGBTQ community, and HUD law around safe shelter and fair housing for LGBTQ individuals. In this workshop participants will learn about the unique characteristics of young adults who are homeless, how their needs differ from the adult population, and ways shelters have created better models to attract and serve this vulnerable and often invisible population. This workshop will provide a brief introduction to the theory and practice of Person-Centered Planning (PCP). PCP is increasingly recognized as an innovative and evidence-based approach to promote team-based planning across a range of professionals to effectively support individuals and families with complex needs that contribute to housing instability and homelessness. Executive Directors/CEOs and Shelter Directors only please. This workshop is sponsored by the Liberty Bank Foundation. Nan Roman, President and CEO of the National Alliance to End Homelessness and keynote speaker of the 2017 ATI, will lead a roundtable discussion for Executive Directors and Program Directors on emerging trends and the practical application of shelter diversion. Audience members will have the opportunity to engage directly with Ms. Roman on the challenges and benefits of integrating shelter diversion into the emergency response process. Now in year two of its pilot, Secure Jobs CT has made strides and learned valuable lesson in systems change. This workshop is designed to promote client focused system development by exploring 4 keys to system change discovered through the Secure Jobs pilot. Jessica Rivera, Thames Valley Council for Community Action Inc.
Joel Rivera, New Opportunities Inc.